HP Police Constable Recruitment 2019 Himachal Pradesh Police Constable Male Female HPP CT Driver 1063 Vacancy Notification Pdf Online Application Form Last Date PET Exam Pattern Syllabus – Himachal Pradesh Police Department is conducting a Recruitment of 1063 Constable GD Male Female & CT Driver Posts. Check Full Details of HP Police Constable Recruitment 2019 With Latest News Update and District Wise Vacancy Breakup. Here We indicating Age Limit, Educational Qualification of HP Police Constable Driver and Application Form Fee Date & Selection Process of Himacal Pradesh Constable Driver Jobs. HP Police Constable Bharti Process 2019 to be initialed form April 2019. Participants can Get Link of HP Police Constable Notification Pdf Download and Online Application Form Apply Link of HPP Constable on this Page. Candidates Will Also be Able to Check HP Police Constable Exam Date and Exam Pattern Syllabus of HP Police Constable 2019 Recruitment Exam. Himachal Pradesh Police (HPP) has published New Notification having details of 1063 Constable and Driver Vacancy on March 2019. The Online Application Form of HP Police Constable Driver Bharti 2019 will be started form 30 March 2019 and Last Date is 30 April 2019. Candidates Those Have Required Physical Standard Eligibility & Educational Qualification of 12th Class Exam Pass and Their Age Limit is Between 18 to 23 Years can proceed the Application form. Before Applying They Must Go through the Himachal Pradesh Police Constable Recruitment 2019 Full Details Mention Below. As per Official Notification, Total Number of 1063 vacancies are Advertised for HP Constable & Driver Recruitment. The Details of Post Wise and District wise vacancy Breakup is as below mention. 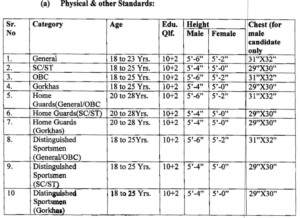 Candidates if Your Want To Apply On HP Constable GD & Driver Recruitment 2019 Must Check the Details Link Physical Standard Test (PST) Eligibility, Educational Qualification and Age Limit Criteria as given in below table. The HP Police Application Form 2019 of HPP Constable GD Driver Recruitment are invited Online Mode that to be released on 30th March 2019. When the Online Form will be begun Candidates will have to Visit the citizenportal.hppolice.gov.in Website and apply through the given link Apply Online for HP Police Constable GD Driver 2019. Fill carefully the Application form and submit. After Submission of HP Police Constable Online Form 2019 must take a print out for further use.